To prove to your dad that you can become a great farmer, you move to an empty farm near your Uncle Frank's ranch. 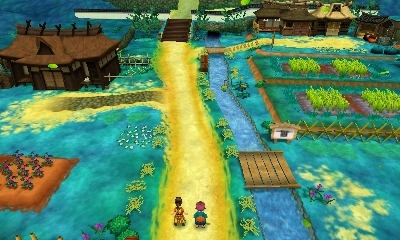 Outside of your farm area you'll find a Crossroads that leads to three unique villages. Each of these towns have their own crops you can grow on your farm, different styles of cooking recipes you can try out in your kitchen, a variety of fruit tree seedlings you can use to grow a great orchard, and many other features that distinguish each town from its neighbors. You can concentrate in one town's specialities or diversify by nurturing the culture of all of the towns. The town's aren't just culturally different; they also can have different weather from what is taking place on your farm. The only exception is with summer and winter season storms. If you do have a storm brewing on your farm, it will also be blowing through the other three towns. Each town is divided into two sections: north and south. The northern part of the towns have an entrance to the neighboring towns so you don't have to run back to the Crossroads to visit the other areas. You'll find a lot of wild animals wandering around the towns, and the cats/dogs you see are placeholders for StreetPass hits. The first town you can visit is Westown, the place that your uncle calls home. It is an arid place with a country western feel. The southern area of Westown is where you can find a stream and waterfall where you can go fishing. There are also two ranches: one owned by your Uncle Frank, and the other managed by his neighbor Megan and her son (Hector) and grandson (Colin). Eventually you'll also meet Dessie, the Westown guardian. She lives by the waterfall behind Megan's ranch. You can toss gifts into the water beneath the waterfall as offerings to the Nature Goddess, which will be accepted by the mini goddess in training. 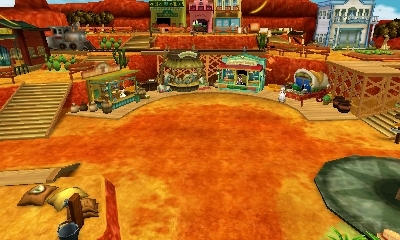 The northern side of Westown is where the merchant shops are located as well as the great Buffalo statue and the ore mines. The town is divided into several levels with staircases leading you to each area. The bottom level is where you'll find vendors who sell animals, cooking ingredients, and construction materials such as lumber and gems. The middle level of town contains the town's health clinic managed by Dr. Ford and the Postio building where you can send letters back to your family or to other villagers. The top level of Westown has the Garden Grill restaurant, Lisette's flower shop, and Miranda's general store, Straw Market. The second town that you'll have access to is the tropical Lulukoko. This town unlocks on Spring 15, where you'll be introduced to village elder Tototara. Lulukoko is a warm and exotic location along the ocean shore. 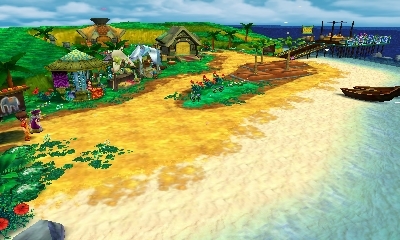 The southern portion of Lulukoko has several merchant booths that sell fruit, cooking ingredients, and fishing bait. The shoreline is a great place for fishing! If you get hungry, head over to Iluka and Siluka's beachside tea house for a tasty treat. The mighty angler Zahau lives in this area along with his family: Caolila, Alma, and Schalk. The research scientist Mithra also lives here along with her poor assistant, Lotus. In northern Lulukoko Village you'll find a great bonfire that always burns. This fire protects the village and gives it light during the night. There are two additional shops in this area, a general goods store and Ludus' all-important carpentry stop, Relacion. Ludus is the person you need to hire to make any Farm Circles, tool upgrades, house remodeling, and storage expansions. He even crafts clothing. What a handy guy! Behind the town's Lala Salama that acts as an Inn if you want to stay the night, is the ancient ruins. This place is special to the Lulukoko villagers. You will find Tototara cleaning the shrine, the twins dancing for it, and a strange little girl living inside of it. Grouchy Witchie is the magical deity who was sleeping soundly in her froggie bed until you woke her up. She can use her magical powers to change the face style and eye color of your character. The last town is Tsuyukusa Town. This place is between Westown and Lulukoko Village and unlocks on Summer 5. You'll meet Ginjiro, who runs the Tea-ful Reunion restaurant in town. The southern section of Tsuyukusa Town is a farming community where you'll find Umekichi and Omiyo, who have been growing rice on their farm for years. They are also hosting their grandson, Yuzuki, who has a knack for crafting beautiful wearable accessories (although he doesn't sell them directly). To the north of the rice fields is the main village area. There are plenty of shops here that sell a variety of goods, including an outdoor hair salon where you can change the color and style of your lovely locks. This place also contains the Ra Man's Wholesale Store where you can find Shizu's clothing outfits, Ittetsu's general goods, and Hinata's crop shop. The bazaar manager is a gruff fellow named Moriya, but he just has a rough exterior; he has a soft spot for his cat, Daikoku. Ittetsu and Shizu live with their sons, Tatsumi and Yaichi, in the southern agriculture area of Tsuyukusa. There is also a school in Tsuyukusa, run by teacher Kasumi, but you can't visit its interior. By the school is the shrine to the village's deity, Inari. This fox spirit is invisible to everyone but Dessie, Witchie, and yourself. Inari looks after the Tsuyukusa residents, yet wishes to experience the same things that the mortals experience. Perhaps you can help that dream by marrying Inari.